Only a few days to go until Christmas and the Santas are appearing thick and fast on the streets of Tokyo. The department stores have been in full festive mode all the way back to Halloween and I have to admit my first Christmas dinner was actually on December 7th, which feels and eternity ago from where I'm standing today. There are no carol singers on the streets but the stores have been making up for that with rolling renditions of "Last Christmas" playing over and over again (not bad for a thirty year old song). The interesting thing is though that Christmas actually isn't a big deal in Japan. Companies are open for business, most staff wouldn't even think about taking the day off. The 23rd is a national holiday but that's because it's the Emperor's birthday (an event with its own story) but Christmas Day is part of the normal working calendar, most companies opting to close over the New Year instead. But Christmas Eve will see a couple of interesting traditions. KFC will be stockpiling entire flocks of chicken wings remembering "Christmas isn't Christmas without Kentucky Fried Chicken" surely one of the most effective advertising campaigns of all time. And then there's the Christmas Eve date. Despite the street campaigns by the self titled "Christmas Losers" (there might be a good reason for the name), every single person in Japan will be with someone special for the evening. Even if there is no one that special, they'll find someone to share their company. It's a nice tradition, no idea where it came from. But whatever, a Fine and Happy Christmas to you all! 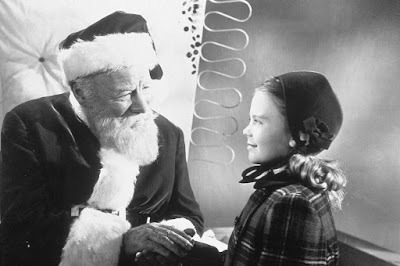 A Miracle on 34th Street - Best Christmas movie ever!